To play, all you need is one business card. Any business card. Darts! The only sport you can play in between supping a pint and nibbling pork scratchings. In this game, you are a darts champion, trying for the World Championship title. You simply have to score exactly 180 points before your opponents. If you’re playing solo, you’ve got to hit exactly 180 points with 9 darts or fewer, or you can just throw 9 darts and try to beat your highest score – maximum (im)possible score is 540. Fold the business card in half. Let it spring back to shape until the fold is at about 90 degrees (plus or minus 10 degrees). 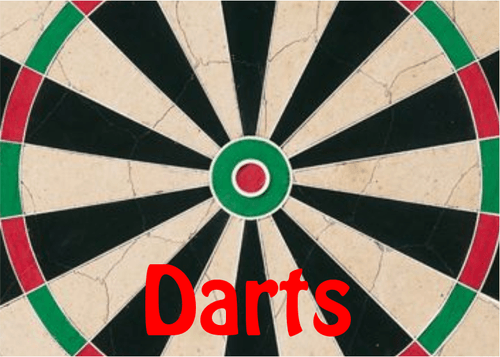 Each player’s turn consists of “throwing” up to 3 darts. Players throw a dart by holding it either 6 or 12 inches above the table and dropping it. (6 inches is the height of a pint glass.) Points are scored according to how it lands. Also check out my other contest entry, Stock Dump. Nice. I'll try it out. Also, darts! Not a common board/card game theme! Nice simple idea for a single-card game. I tried this game out by writing the numbers on my own business card. I played a few solo games, and usually got a score of ~80 with 9 darts. I realized that, in order to reach 180 points in 9 darts (3 rounds of 3 darts), you have to land the card on its side at least twice at 12 inches, or at least three times at 6 inches, and doing it within the same round of 3 darts so the score is multiplied. Otherwise, you can't get a high enough score to reach 180. Getting the card to land on its side is very difficult! I was lucky if I managed it twice in a game of 9 throws, and it was never more than once within the same round of 3 throws. Is it supposed to be this hard, or am I just terrible at it? At first, when I saw the design of the card in your rules, I expected that the different "zones" of the dartboard image on the card would have some significance (especially since some of the numbers line up inside the zones), since these "zones" on an actual dartboard do have significance. After reading the rules, I figured out how to play the game without any problems, so this wasn't a big deal, but still something to be aware of. I missed your comment until now - thanks for trying out the game! Yes, the solo challenge is supposed to be hard. Getting the card to land on its side from 12 inches is indeed difficult (less so from 6 inches). But with a bit of practice (and various theories about fold angles) I was managing to do it about one time in three.